The purpose of this study is about comparison of non-woven and 0.45 µm pore size real membrane placed in one aerobic tank and under same conditions. Comparison has been made between dynamic membrane bioreactors (DMBR) and membrane bioreactor (MBR), which have been employed in a widespread manner, to develop a convenient solution of high membrane cost handicap. Both membrane types operated under same aerobic conditions such as; volume, LMH and SADm. In addition, they have been fed with synthetic municipal wastewater and operated periodically to hinder membrane fouling. At the end of approximate one-month adaptation time course, bioreactors, which have reached stable conditions, have been operated to gather the data throughout 60 days. COD removal rates and turbidity results have been compared and non-woven dynamic membrane results have shown similar results to real membrane in terms of efficiency. Furthermore, dynamic membrane has exposed air back wash and pressure changes examined. While average COD removal is determined 93% for non-woven dynamic membrane and 95% for 0.45 µm pore size real membrane, turbidity values haveobtained1,5 NTU and 0,7 NTU for non-woven and 0.45 µm real membrane, respectively.
.	S. Judd, The MBR book. Oxford, Elsevier, 2006.
.	G.T.Seo, B.H. Moon,T.S. Lee,T.J. Lim, I.S. Kim, Non-woven fabric ﬁlter separation activated sludge reactor for domestic wastewater reclamation. Wat. Sci. Tech., 47(1), 133–138, 2002.
.	H. D. Park, I. S. Chang, K. J. Lee, Principles of Membrane Bioreactors for Wastewater Treatment, CRC Press, Taylor&Francis Group, 2015.
.	W.Fuchs, C.Resch, M.Kernstock, M. Mayer, P.Scoeberl, R. Braun,Influence of operational conditions on the performance of a mesh filter activated sludge process. Water Res. 39 (4), 803–810, 2005.
.	Y. Kiso, Y.J. Jung, K.S. Min, W. Wang, M. Simase, T. Yamada. Coupling of sequencing batch reactor and mesh filtration: operational parameters and wastewater treatment performance. Water Res. 39, 4887–4898, 2005.
.	M.H.Al-Malack and G.K. Anderson, Formation of dynamic membranes with crossflow microfiltration. J. Membr. Sci. 112, 287–296, 1996.
.	C. Wisniewskand A. Grasmick,Coll Surf A: PhysicochemEng Aspects 138:403, 1998.
.	P.Côté, D. Thompson, Water SciTechnol 41:209, 2000.
.	Y. Wu, X. Huang, X. Wen, F. Chen, Function of dynamic membrane in selfforming dynamic membrane coupled bioreactor. Water Sci. Technol. 51 (6–7), 107–114, 2005.
.	L. Chu andS. Li, Filtration capability and operational characteristics of dynamic membrane bioreactor for municipal wastewater treatment. Sep. Purif. Technol. 51, 173–179, 2006.
.	F. Li, J. Chen, C. Deng, The kinetics of crossflow dynamic membrane bioreactor. Water SA 32 (2), 199–203, 2006.
.	H.Q. Chu, D. Cao, W. Jin, B.Z. Dong, Characteristics of bio-diatomite dynamic membrane process for municipal wastewater treatment. J. Membr. Sci. 325, 271–276, 2008.
.	D.W. Cao, H.Q. Chu, W. Jin, B.Z Dong, Characteristics of the biodiatomite dynamic membrane (cake layer) for municipal wastewater treatment. Desalination 250, 544–547, 2010.
.	D. Jeison, I. Diaz, J.B. van Lier, Anaerobic membrane bioreactors: are membranes really necessary? Electron. J. Biotech. 11 (4), 1–7, 2008.
.	A.E. Marcinkowsky, K.A. Kraus, H.O. Phillips, J.S. Johnson, A.J.Shor, Hyperfiltration studies IV. Salt rejection by dynamically formed hydrous oxide membranes. J. Am. Chem. Soc. 88 (24), 5744–5750, 1966.
.	D. Freilich, G.B. Tanny, The formation mechanism of dynamic hydrous Zr(IV) oxide membrane on microporous supports. J. Colloid Int. Sci. 64, 362–370, 1978.
.	T. Ohtani, M. Nakajima, Y.Nawa, A. Watanabe, Formation of dynamic UF membrane with fine Zr particles. J. Membr. Sci. 64, 273–281, 1991.
.	M. Rumyantsev, A.Shauly, S.Yiantsios, D.Hasson, A.Karabelas, R.Semiat, Parameters affecting the properties of dynamic membranes formed by Zr hydroxide colloids. Desalination 131, 189–200, 2000.
.	M. Altman, R. Semiat, D. Hasson, Removal of organicfoulantsfromfeedwatersbydynamicmembranes. Desalination 125, 65–75, 1999.
.	R.Y.Horng, C. Huang, M.C. Chang, H. Shao, B.L.Shiau, Y.J. Hu, Application of TiO2 photocatalytic oxidation and non-woven membrane filtration hybrid system for degradation of 4-chlorophenol. Desalination 245, 619-182, 2009.
.	Y. Zhao, Y. Tan, F.S. Wong, A.G. Fane, N. Xu, Formation of Mg(OH)2 dynamic membranes for oily water separation: effects of operating conditions. Desalination 191, 344–350, 2006.
.	J. Y. Lee, S. K. Maeng, B. K. Choi, K. H. Ahn, K. G. So, Characteristics of ﬂux and gel layer on microﬁlter and non-woven fabric ﬁlter surface based on anoxic–aerobic MBRs, Bioprocess Biosyst Eng, 35:1389–1398, 2012.
.	L. Chu and S. Li, Filtration capability and operational characteristics of dynamic membrane bioreactor for municipal wastewater treatment, Separation and Purification Technology, 51, 173–179, 2006.
.	X. H. Zhou, H. C. Shi, Q. Cai, M. He, Y. X. Wu, Function of selfforming dynamic membrane and biokinetic parameters determination by microelectrode, Water Res 42:2369–2376, 2008. ISNAD Veral, Metmet Akif . "Comparison of Performance of Conventional Membrane Bioreactor with Dynamic Membrane Bioreactor". 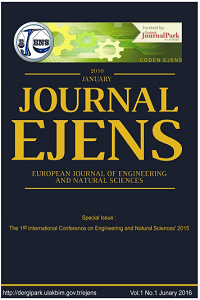 European Journal of Engineering and Natural Sciences 2 / 1 (February 2017): 21-28.